Twin babies were always together. We decided to have one of them as our pet. However, they were only twenty days old, so it was still recommended that they were with their mother. They needed enough nutrition through their mother’s milk to grow strong and healthy. So, we waited to come for the goat after he was forty days old. On March 5th, the day came to go to Okayama. 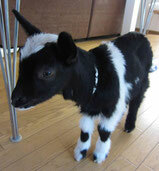 After a long trip by bullet train, our goat finally came to our house! He was 11 lbs so we could easily hold him.